Q: Why Fly In A Spitfire with aerolegends.co.uk & goactionstations.co.uk in Southern England? A massive “Thank You” for a truly fantastic day yesterday. The flight was everything I expected it to be, and even a bit more. Your team made the whole day truly superb for us all and I have a sneaky suspicion I may be back one day!!! 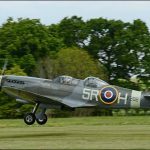 Fly In A Spitfire with goactionstations.co.uk and you can enjoy the UK’s most popular Spitfire Experience from Headcorn Aerodrome in Kent or from Sywell Aerodrome Northamptonshire. 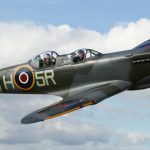 Headcorn is the only location in the United Kingdom to offer an affordable opportunity to Fly In A Spitfire in Battle Of Britain airspace with views of the iconic Kent, English Channel coastline. Just to the East of Headcorn there are no flying height restrictions, so customers can experience a whole raft of classic Spitfire flight manoeuvres. Sywell offers the opportunity to Fly In A Spitfire in the same airspace that the Dambusters used in May 1943 over the Eyebrook reservoir. During the night of May 14 to 15, the 19 crews of 617 flew their last training exercise before the raid, codenamed Operation Chastise. The Midlands was responsible for building over 12,000 Spitfires during WW2 at the Castle Bromwich factory, so you will be at home flying here. There are no flying height restrictions, so customers can experience the full raft of classic Spitfire flight manoeuvres.